Natural Selection is the process by which the most favorable alleles of genes are inherited by offspring. It is one of the major driving forces of evolution and was pioneered by Charles Darwin after his voyage to the Galapagos Islands. Let's say, theoretically, the termite population only eats cedar. 2 I still don’t get it. 3 Like the band? The Offspring? 4 Yes. Animals Who hide in Cracks Will be Selected Naturally by Animals With Long Noses. 5 Then Why Haven’t Human Noses Grown Over Time? 7 So you're saying that this Lamarck guy directed Transformers? 8 I still don’t get it. OK, say you have a termite population and that population only eats a certain type of wood, like cedar. The survival of that population hinges on the availability of cedar. Now let’s say a few termites have mutated alleles that let their bodies also process oak. 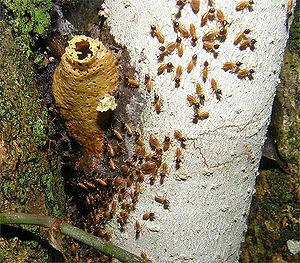 These few termites now have two options for nourishment, and they are more likely to survive when cedar resources are sparse by switching over to eating oak. Let's say, theoretically, that these fish have to find a new way to eat their favorite shrimp. OK, say you have a population of fish that only eats a certain kind of shrimp. And global warming forces the shrimp to start living in deep cracks in the sea floor. Only the fish with long and narrow enough snouts will be able to reach the shrimp. Thus the less capable fish will die while the more able fish will thrive. These fish will then pass on their long-snout genes to their offspring. Like the band? The Offspring? What? Like the band? What are you talking about? Offspring is another term for children. Like you are the offspring of your parents. Understand? It has nothing to do with a band. But you understand natural selection now, right? Yes. Animals Who hide in Cracks Will be Selected Naturally by Animals With Long Noses. No. That’s not what Natural selection means. 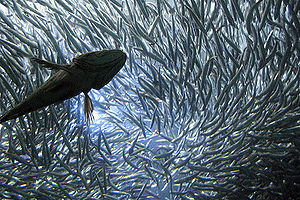 Natural Selection refers to the process by which organisms with favorable traits are “selected” by “nature” to survive. 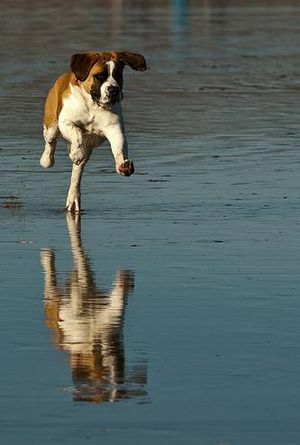 Let's say, theoretically, your dog likes to swim and eat fish. Then Why Haven’t Human Noses Grown Over Time? Because humans, who are apes, don’t need longer noses to survive. Natural selection can apply to any gene. OK, say you have a bunch of dogs who love to eat fish. These dogs will keep diving and swimming underwater so that they can catch them, but the ones who can swim better will catch more fish. The ones who cannot eat fish will die. Eventually only the best fishing dogs will survive and they will have children, which we call "puppies". These children will most likely also be good at fishing because they have their parents good fishing genes, like silkier coats, or better vision. No, they will not have better fishing poles, they are dogs. Piano skill is learned not inherited. That would be Lamarck’s theory of transformism. And he was wrong. He had a good idea, he was just wrong. Science allows for mistakes because we cannot gain knowledge without learning from our missteps. So you're saying that this Lamarck guy directed Transformers? What? No, Lamarck did not direct Transformers. Just don’t sire any puppies, OK? This page was last edited on 8 October 2012, at 23:35.